In the previous post in the series, I questioned whether a 3rd place finish with Eastbourne was the slope or the summit. Was this the start of something big, would we push on an earn promotion off the back of finishing 3rd? Or was it the summit, the peak of our performance? Would it be downhill from there onwards? This post will reveal all. Last season was a beautiful season. Eastbourne Borough fought valiantly for the title that was won by a dominant Billericay. Erwin van Dijk’s side then came so close to an astounding promotion through the playoffs, only to be beaten by the narrowest of margins by Maidstone. This was our peak. Our summit. And from that point forward the only way was down. Erwin van Dijk stayed with Eastbourne despite his doubts towards the end of last season. Though his ambitions are to manage at the highest level, van Dijk still considers himself to be loyal and Eastbourne have treated him well. The entire squad are in support of van Dijk and it would be churlish to throw that in their face and leave the club when on top. The 2020/21 season began and Eastbourne started with an emphatic 5-0 win in their first match. Already thoughts were floating around the Eastbourne dressing room that this was their year, there was no likelihood of there being another Billericay to spoil their promotion push. It is clear that complacency set in and from hereon Eastbourne lost their focus. Eastbourne were lauded for their excellent defence last season – it was considered to be the main factor behind their terrific season. This year, Eastbourne conceded 16 goals in their first 8 games – compare this to the four goals conceded at the same stage last season. A change in tactic was needed. Though simple, the small tweak to our tactic yielded wonderful results. We were more compact in defence, despite moving our DM forward, as we no longer invited opponents to attack us. Instead we took the initiative to attack and, as the stronger team, we managed to pull back our form and work our way back up the table. This, sadly, was as good as it got for van Dijk and co. From gameweek 16 onwards, Eastbourne lost their form and were unable to regain it. 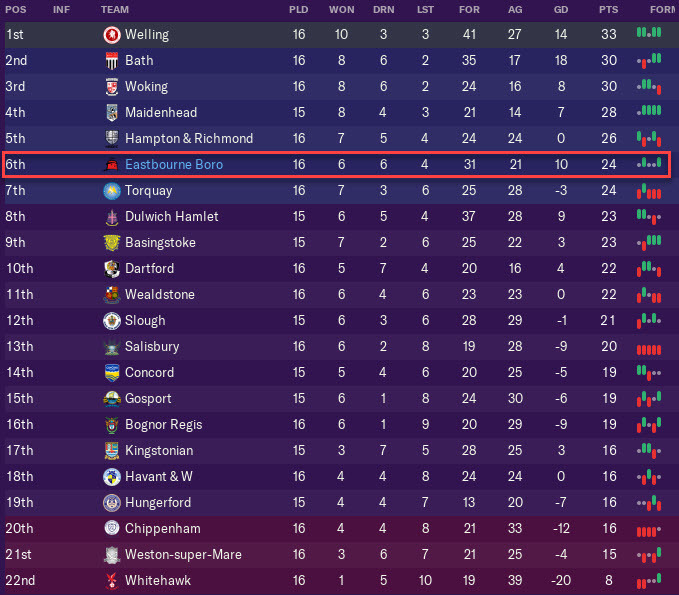 Despite, or perhaps as a result of, numerous tactical tweaks, Eastbourne slipped down to 17th in the table at one point. This resulted in van Dijk being summoned to the boardroom for the first time in his managerial career. Defeat to Basingstoke left us in 15th position after 31 games. The board called van Dijk in for a meeting to discuss his future at the club. 9 points from the next five games was not impossible, but it seemed unlikely given our inconsistent form. We’d lost four of our last five games and couldn’t string good performances together. The first game of our five matches came against 11th placed Havant & Waterlooville at home. The majority of our points have come at home this season and so this was an agreeable start to our run. Kyran Lofthouse opened the scoring after latching onto a through ball from Michael Mullings. Lofthouse slotted the ball into the net to make it 1-0 and Eastbourne held on for the narrowest of wins. Despite looking confident for most of the game, a 1-0 scoreline is always precarious and considering our form this year I wasn’t confident of holding on. But somehow we managed it and this was the perfect start to our run. The next fixture came against Bath, again at home. Bath were 3rd in the league and on a good run of form. Eastbourne, on the other hand, were coming into the game off the back of a much-needed victory. Winger Charlie Lawrence scored the first goal of the game after getting on the end of a Nathan Lyons cross. Bath replied with two quick goals in the 24th and 26th minute, turning the match completely on its head. Eastbourne top scorer Kyran Lofthouse scored his second goal in two games to bring the scores level. In the final moments of the first half, Bath netted another goal – Eastbourne trailed 3-2 at half time. In a quieter second half, Lorent Tolaj scored the vital goal to earn a point for Eastbourne, yet the atmosphere coming away from Priory Lane was one of what could have been. In the final minutes of the game, Tolaj threaded a ball to Lofthouse who smashed the ball against the bar. A win would have seen Eastbourne require three more points to save van Dijk’s job. Perhaps the most disappointing match of van Dijk’s career came away to 20th placed Hungerford. Eastbourne created virtually nothing for the entire ninety minutes, instead being limited to long shots as Hungerford were keen to settle for a draw. Mark Smith, our ever-present goalkeeper, scored an own goal against Torquay and this pretty much settled our fate. Smith wasn’t to blame, there was nothing he could do about the goal. Eastbourne deserved nothing from the match and that is what they got. A 3-0 loss in no way flattered Torquay as they dominated the match. 5 points from 4 games meant that it was impossible for Eastbourne to reach the 9 point target set by the board. Erwin van Dijk has been sacked from Eastbourne. His two-and-a-half year stay has come to a premature end after a poor run of results. There were many players to have made a huge impact in his Eastbourne squad’s and I will run through a few of them here. But first I’d like to highlight a member of van Dijk’s staffing team that has shown great loyalty to van Dijk by leaving the club upon his sacking. Christian Ribeiro. 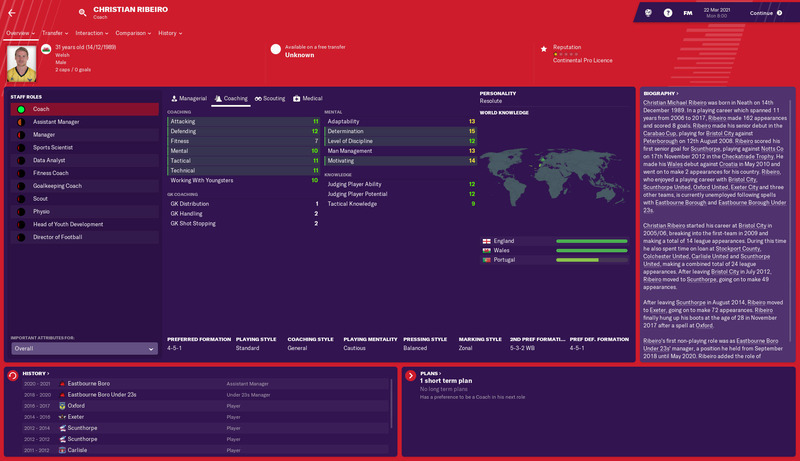 Welshman Ribeiro was appointed Under 23’s manager in van Dijk’s first season and he was quickly promoted to become his assistant manager. Ribeiro and van Dijk developed a strong bond over the years and it is certain that the two will meet again in some capacity. Carl Harban was one of van Dijk’s first signings at Eastbourne. In two-and-a-half years Harban has become Eastbourne captain with his excellent leadership qualities. Harban made 115 appearances under van Dijk, scoring 8 goals and making 12 assists. One of the key factors behind Eastbourne’s incredible 3rd place finish last season was the solid defence and Tom Gardiner was the mainstay in the centre of that defence. Gardiner played 123 matches for Eastbourne under van Dijk and he would hopefully help to steady the ship after van Dijk’s dismissal. Mark Smith is, quite predictably, the highest appearance maker under van Dijk – he played 142 out of 145 matches since van Dijk joined the club. His 17 clean sheets in the second season were key in winning games and propelling Eastbourne to 3rd in the league. Kyran Lofthouse first came to Eastbourne on loan in van Dijk’s first season. He didn’t make too much of an impact, scoring 2 goals in 10 league matches. But van Dijk had faith in the youngster and turned his loan into a permanent move, signing him on a free. Lofthouse repaid his faith and ended scoring 52 goals in 91 games for Eastbourne. The final player to discuss is youth academy graduate Nathan Lyons. Lyons came through the Eastbourne academy in season two and was rewarded with some first-team minutes due to a lack of depth in the first team. Lyons became a more important member of the first team squad in season three and went on to make 37 appearances in total, scoring 1 goal and making 4 assists. Erwin van Dijk has formed many bonds with his players over his time at Eastbourne Borough, and these five players helped create the side that came so close to promotion last season. I’m sure these players will hope to reunite with van Dijk one day. Sacked from Eastbourne – What’s next for Erwin van Dijk? Being sacked from Eastbourne dealt a blow to van Dijk’s reputation in English football, yet it remains high enough that he should be able to find another job in and around the level of Eastbourne. Van Dijk was rather eager to get straight back into management but he would certainly take his time to consider any approaches he received. The Bromley job came up a month after his departure from Eastbourne. Bromley sat in the relegation zone of the Vanarama National League with six games to play and only points away from the team above. This presented an interesting opportunity for van Dijk – if he took over the club and won survival he would be in a league higher than Eastbourne. Conversely, if he was relegated with Bromley he would be favourites to return straight back next season. Van Dijk applied for the Bromley job, expecting a quick response considering their situation. Time passed without a response and van Dijk assumed he would not be approached for the job. Then came a call from the Bromley board who wanted to interview van Dijk for the role. The interview went well and Bromley decided to approach van Dijk to become their manager. However, by the time that the interview process was over, Bromley only had two games remaining of the season and sat 5 points adrift of safety. It would take a miracle for van Dijk to pull off survival and the thought of joining a club only to suffer immediate relegation was not a prospect that enticed van Dijk. What do you think van Dijk should do? Vote on the poll! 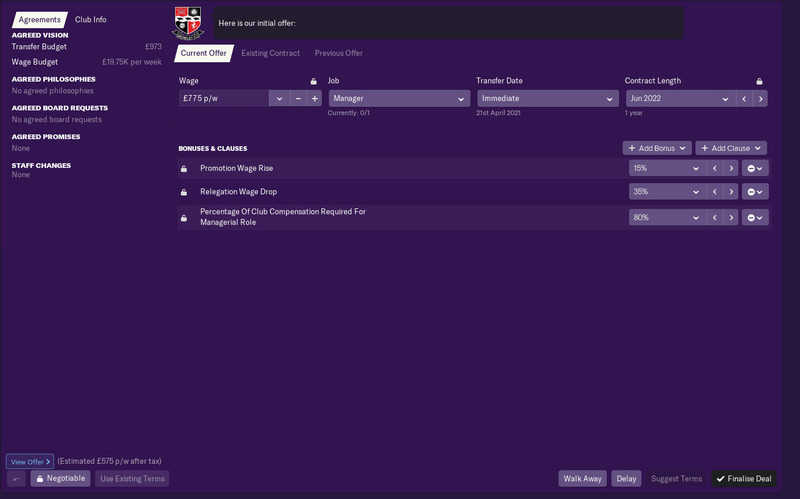 The next post in this series will reveal van Dijk’s decision and will introduce his new club, whether that be Bromley or another side in football. If you want to stay updated with further updates from this blog, follow us. You can find this option in our sidebar. Thanks for reading! 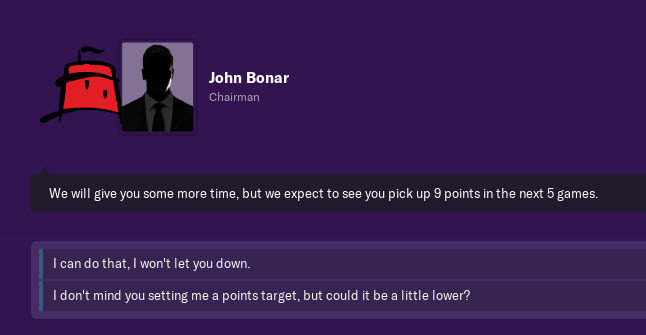 This entry was posted in Achievement Hunter Challenge | @VivaLaVidaFM, FM19 Stories, Football Manager 2019 and tagged achievement hunter challenge, eastbourne borough, england, fm stories, fm19, football manager, Football Manager 2019. Bookmark the permalink.